People have been arguing about the value of culture for 200 years (or 2,500 years if you’re a Classicist), but the current debate can be traced back to a conference held at the National Theatre Studio in June 2003. It was titled Valuing Culture, and it gave a voice to the then New Labour government, who were dissatisfied at their lack of progress with public service reform, and the cultural sector, who were resisting that same government’s imposition of an instrumental regime of targets and quantitative measurement. The widespread frustration cultural organizations were feeling with the instrumentalism being imposed on the cultural sector was dramatically highlighted by the newly appointed artistic director of the National Theatre, Nicholas Hytner, in an article for The Observer on 12 January 2003, headlined simply, “To Hell With Targets”. At Demos we had been thinking along similar lines, and we had also been influenced by the Harvard academic Mark H Moore’s concept of “Public Value” (Moore 1995), which was given a platform in the UK through a research paper produced by the Strategy Unit of the Cabinet Office: Creating Public Value: An analytical framework for public service reform (Kelly et al. 2002). So we got together with Adrian Ellis of AEA Consulting, who was advising both the National Theatre and the National Gallery, to put on the Valuing Culture conference. The Secretary of State for Culture, Tessa Jowell, heard about our plans, and decided to contribute. Her speech rehearsed arguments that later appeared in her “personal essay” Government and the Value of Culture, in which she asked the key question: “How, in going beyond targets, can we best capture the value of culture?” (Jowell 2004.18). Awareness of the potential usefulness of Public Value was by no means confined to the cultural sector. The management consultancy Accenture developed a “Public Service Value Model” (Cole & Parston 2006) that could be applied to areas such as policing and health. (The National Trust subsequently commissioned Accenture to apply its model experimentally to the running of three of its properties (Accenture/National Trust 2006).) The BBC adopted Public Value in its strategy for the renewal of its charter at the end of 2006, which led to the creation of the BBC Trust. As explained in Public Value in Practice: Restoring the ethos of public service (Coyle 2010), the BBC Trust is now required to carry out a Public Value test on any major proposal that comes to it from the Board of Management. That includes the changes to BBC3. The BBC had been helped by the Work Foundation, which went on to establish a consortium that included the DCMS, the Home Office, the BBC, the Metropolitan Police, OFCOM, the National Health Service Institute and the Royal Opera House, to support a wide ranging exploration of Public Value (Coats & Passmore 2008). In 2006 Arts Council England conducted its own Public Value enquiry, whose results are reported in Public value and the arts in England (Bunting 2007). Launched by the Jerwood Foundation in 2004, “Mission, Money, Models” also contributed to the debate, while the AHRC funded three projects on measuring the “impact” of the arts, including Shakespeare. Our own work on cultural value came out of a commission in 2004 from the Heritage Lottery Fund to review the way it had been evaluating its programmes, Challenge and Change: HLF and Cultural Value (Hewison & Holden 2004). We chose to use the term Cultural Value as a more specific version of Public Value, because questions of aesthetic and spiritual value are more urgent in the cultural sector than they are to the Police. Institutional value was not fully developed in Challenge and Change, but in two Demos pamphlets, Capturing Cultural Value (Holden 2004) and Cultural Value and the Crisis of Legitimacy (Holden 2006), institutional value was proposed as the best way to express the public value that cultural organizations created (or destroyed) through their inter-actions with the public. The concept was further developed in Not a Sideshow: Leadership and Cultural Value (Hewison 2006). In the mean time, the Research Department of the HLF had set out to “operationalise” our conception of Cultural Value, and its three facets became the focus of their work (Clark & Maeer 2008). 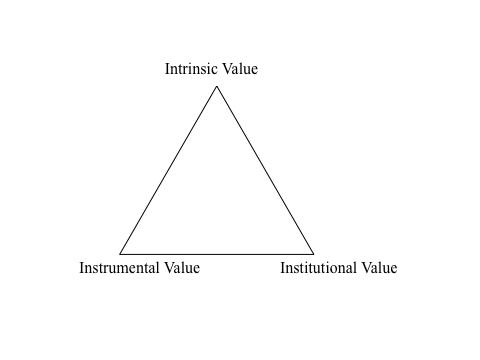 The Cultural Value triangle supplied the framework for a conference organized by the HLF in co-operation with English Heritage, the National Trust and the DCMS in January 2006, whose results are recorded in Capturing the Public Value of Heritage (Clark 2006). At the conference English Heritage introduced its thinking on Cultural Value, launching a consultation on what became Conservation Principles, Policies and Guidance for the Sustainable Management of the Historic Environment in 2008. This was intended as a guide to decision-taking for English Heritage staff, and continues to be used as such. The concept of Cultural Value is most succinctly expressed in the definition of heritage as: “All inherited resources which people value beyond mere utility” (English Heritage 2008.71, italics ours). In order to give the theory of Cultural Value practical application, the HLF commissioned a number of consultancies to research the social, economic and conservation benefits of selected HLF projects. This led to the assembly of an “Outcomes Framework” that has informed its 2008-13 and 2013-18 Strategic Plans. The term Cultural Value is not used in published documents, but the HLF acknowledges that the concept has been successfully developed into a working principle with “intellectual validity” (Clark & Maeer 2008.51), both in terms of the decisions that it makes, and the evaluations that it asks for, once a project has been completed. Ten years on from Challenge and Change, the HLF has asked us to review the way the discourse of Cultural Value has developed. Although Her Majesty’s Treasury still seems deaf to the idea, the AHRC’s “Cultural Value Project” and the work of the Warwick Commission shows that the Valuing Culture debate of 2003 is still going strong, and that there is plenty more to be said.